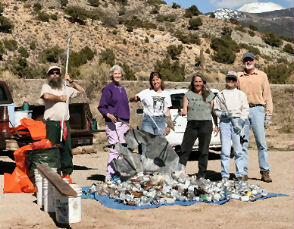 We started doing daily cleanups in Mill Creek Canyon in November 2003. We remove trash and recycling and work to protect the land from damage. We rehabilitate user-created trails, and work on keeping the approved trail clear. It is very rewarding to see the immediate results of our work. We also do cleanups in the streams, on many other trails, and along the highways and byways of this glorious region. We love to see our fellow community members cleaning up, and we invite you to adopt a street, a trail, a section of road, a neighborhood, and keep it free of littered trash and recycling. Please contact us to learn how to get involved! ​Common Thread/Operation Cooperation is a major annual project that aims to protect the fragile desert environment from off-road vehicle damage, and to solve conflicts among different types of users. Click here for more info on Common Thread. 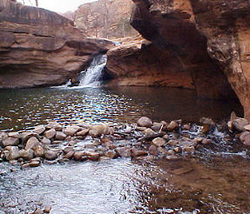 The Mill Creek Partnership is dedicated to working to restore the canyon to its most natural state--while keeping it open and free for all to enjoy. 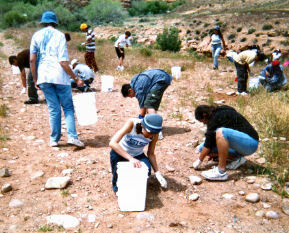 We hold work parties, do cleanups, maintain trails, remove weeds, and encourage "Leave No Trace" hiking. Visit Mill Creek Partnership to learn about volunteering. Media coverage: Group hopes trail signs, bus ban will help preserve landscape in Mill Creek Canyon. Moab Times-Independent. 11/1/12. 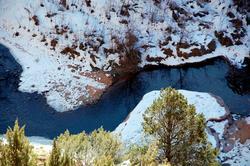 ​In partnership with Moab City, Moab Solutions started Friends of the Parkway in August 2004. ​The project goal is to get all 5+ miles of this beautiful in-town trail system and its spur trails adopted by groups that will remove recycling and trash from small sections of trail. To get involved in a Parkway cleanup, contact us here. It’s amazing to see how much small groups of people can accomplish when working together to remove recycling and trash from the land. It makes an incredible difference to the local environment. We have so much fun removing and redirecting the recycling and trash found along the roads, in the streams and on trails all around this area. It is enormously rewarding to see the immediate results of our efforts. During clean ups, we are treated to close up views of plant and insect life, can focus on the bird’s song and enjoy fresh air, great views and gentle winds. We do group clean ups whenever two or more of us get the urge. Some of us do small daily clean ups while we are out and about. Caution...this can be highly addictive! Two five gallon buckets and a pair of gloves can change the world. Or at least a small part of it! 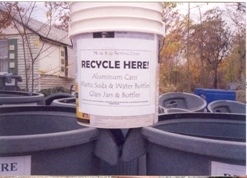 We're working toward getting more folks involved in carrying these items in the trunk of their car and pulling over to do mini clean ups, (5 minutes can yield full buckets and a more beautiful landscape), whenever the mood strikes. One bucket can be used for trash, the other for recycling. You can decorate your bucket too. We can make you something that will work on your bike, too. Since November 2003 we have worked with middle school students, Outward Bound and University groups, and others to remove thousands of unsightly and dangerous glass shards from along the trails and rock ledges on both sides of Mill Creek in the Powerdam area. Click here to learn more about the Glass Project, or contact us to get involved. Since 2006, we've helped hundred of tourists and visitors do litter cleanups and environmental restoration so that they can give something back to the beautiful Moab area during their visit. Click here to read about Volunteer Vacation, or contact us. 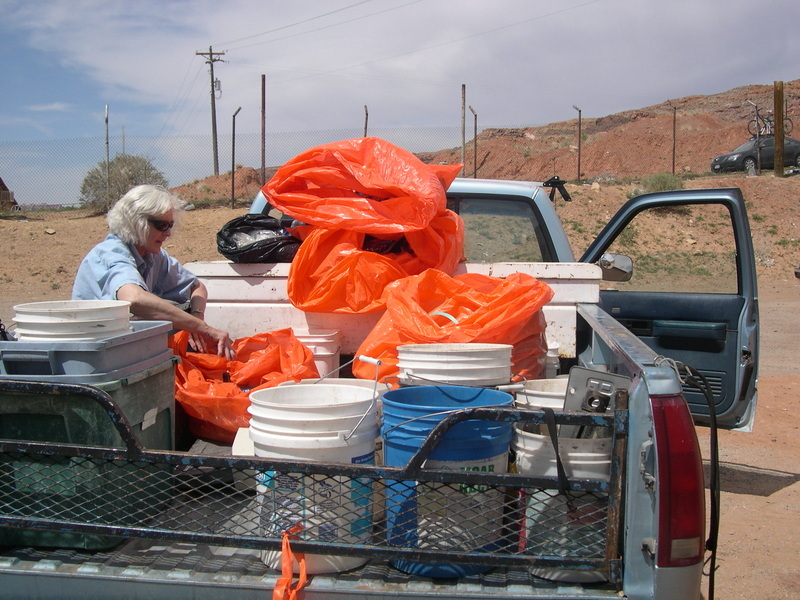 From 2004 to 2008, Moab Solutions helped “Adopt a Highway” groups including KZMU, Grand County Hospice, Lions Club, and Canyon Cruisers recycle many of the items retrieved during roadside litter clean ups. This project is inactive at the moment, but we are open to re-starting it if there is sufficient community interest. If you're part of an Adopt-a-Highway group and would like Moab Solutions to help you recycle some of the litter you collect, please contact us.